THE SUB® is the innovative home tap from HEINEKEN® and Krups®, designed by the highly acclaimed industrial designer Marc Newson. Select your favourite beers from around the globe, place the TORP® in THE SUB®, and enjoy delicious, freshly tapped draught beer. 1.13 THE SUB® makes a noise while cooling the TORP® - is this a problem? We recommend cleaning the tap every time you load a new TORP® to avoid contamination and mixing different beers. You can find an instructional video for cleaning THE SUB® here. You can find an instructional video for cleaning THE SUB® Compact here. Before use, keep TORPS® in a cool, dark place. If there's room in your fridge, keep a spare TORP® chilled and ready to use. Set the fridge at the lowest temperature and put the TORP® on the lowest shelf - this is the fridge's coldest area. DO NOT PLACE THE TORP®IN DIRECT SUNLIGHT, STORE THE TORP®BELOW 30 DEGREES, OR FREEZE THE TORP®. 2.12 Can I swap out a TORP before it is empty? No, beer is not a product made to withstand temperatures below 0 degrees. In addition, the keg may explode if frozen. 4.14 What is the cooling time of a keg? Blade® is an 8-litre countertop draught dispenser that provides a freshly tapped beer. Blade® is not battery powered. Blade® must be plugged into the wall mains with a 2 meter power cable. 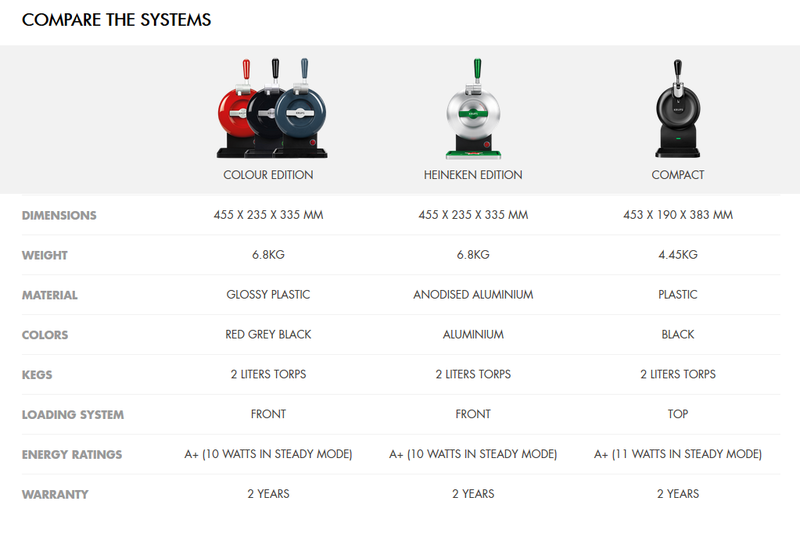 No, the 8 litre keg is designed specifically for the Blade® appliance. If you have successfully referred a friend within the last six months and received a promotion voucher from THE SUB, this code will no longer work. However, to ensure you can utilise your offer if you have not already done so, a new voucher code will be accessible in your new Beerwulf account. Check ‘My referral codes’ in your account on Beerwulf.com for your new voucher by 10 April 2019. 8.2 What is THE SUB® referral program? 8.3 What is Mention Me? 8.4 How can I refer my friend? 8.5 I would like to refer a friend but did not receive a pop-up with a link. 8.6 I would like to refer a friend. Is there a limit to how many friends I can refer? 8.7 How many times can the link be used? 8.8 I referred a friend. What reward will I receive? 8.9 How will I know if my friend has placed an order, and if I qualified for a reward? 8.10 I was referred by a friend. Where should I enter their registered name? 8.11 I was referred by a friend. What is the discount I will receive? 8.12 Where should I enter the code? 8.13 Can I use the offer with other discounts or vouchers? 8.14 How long is the code valid? Standard delivery through UPS is within 1-3 working days when ordered before 3pm. Delivery speed is dependent on shipping address. Delivery of the products will only take place within the United Kingdom mainland (including Northern Ireland). You can also track your shipment via your order number on the UPS tracking site, using your order number as the reference. Should you wish to receive more information, please contact our Customer Care Team.